The Face on Mars: Gone With the Wind? On the Cover: Do you still see the "face on Mars"? 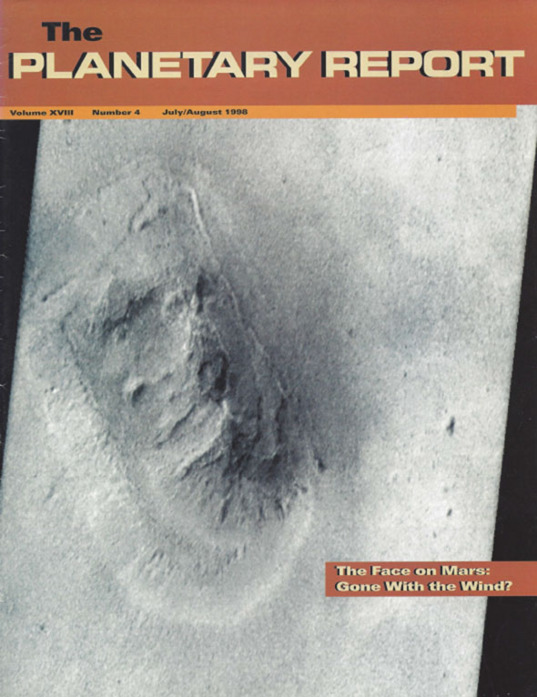 For many viewers who have seen the new images from Mars Global Surveyor, the face is (with apologies to Margaret Mitchell fans) gone with the wind. This particular view of the feature in the Cydonia region has been processed to replicate as closely as possible the lighting effects of the original image taken by Viking orbiter some 20 years ago. The resolution of today's Mars Orbiter Camera is 10 times better than that of the Viking system. 4 Opinion: Searching for Life in the Universe: Scientist Bruce Jakosky explores the different views of scientists versus the interested public when it comes to the search for life on other worlds. 6 The Hunt for Lunar Ice: Jim Burke looks at whether the search for lunar water is finally over. 12 Mars Global Surveyor Observes Dust Storms and Polar Cap Recession: Jennifer Vaughn showcases stunning new images, including the infamous "face on Mars." 15 The Mars Microphone: Ready to Go! Greg Delory gives a report on our microphone, ready for launch aboard the Mars Polar Lander spacecraft. 3 Members' Dialogue International view; is the ISS worth it? 18 News & Reviews The face on Mars, life on Europa, and asteroid/comet impacts. 19 World Watch ISS, NEOs, Euromoon, and Mars Express changes. 20 Q&A How do the atmospheric depths of Venus, Earth, and Mars compare? 22 Society News Shoemaker Grant selection planned; find your name on Stardust.